It may not pay very well, but writing about beer does have its occasional benefits. I'm talking about media-only previews that happen from time-to-time at some of the best places imaginable. You don't have to have no stinkin' badge to get in, but you do have to be invited. These outings, usually sponsored by a brewery, give folks on both sides of the beer community a chance to mingle, taste and talk beer. Tuesday's event was held at Lompoc's Sidebar, located on North Williams next door to their Fifth Quadrant pub and brewery. The drink menu featured a list of beers that will be pouring at the Monster Mash Release Party on Friday. I'm quite sure we tasted some beers that won't be available Friday, but I digress. More on the beers shortly. The Lompoc (officially, New Old Lompoc) story is rich. The place started out as a tavern in Northwest Portland in 1992. In 1996, the then-owners teamed up with homebrewer Jerry Fechter and started making beer. 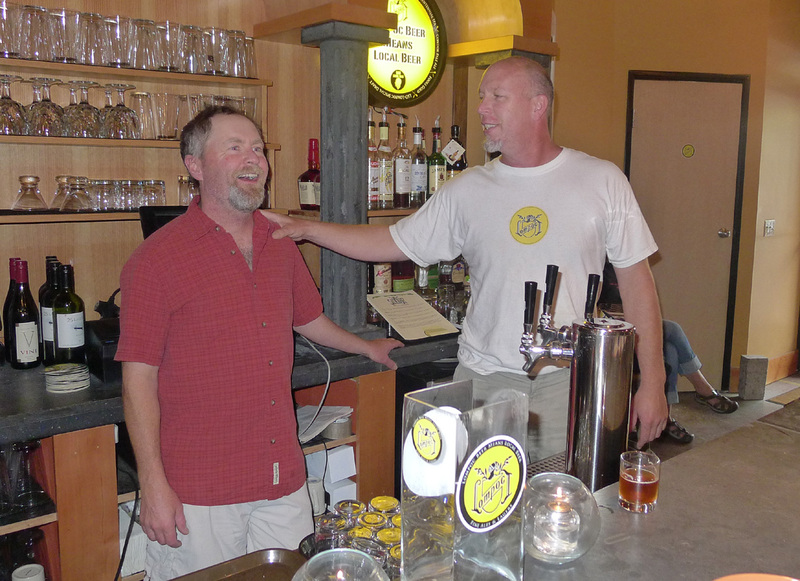 Fechter subsequently took over the business in 2000, teaming up with iconic Portland beer geek Don Younger. 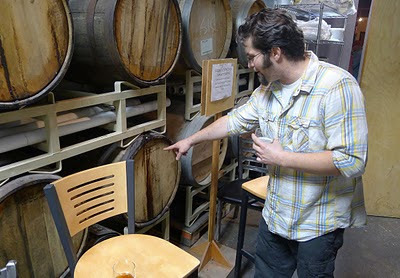 Searching for a partner, Fechter reasoned that he needed someone who was established and well-known in the beer community, someone who could make Lompoc more reputable. He found exactly the right person in Don Younger, who made significant contributions to the business over the years. There's a void now that Younger is gone, but Fechter is carrying on and the business seems to be on pretty solid ground. Lompoc has expanded rapidly and now has five locations: New Old Lompoc (the original) on NW 23rd; the Hedge House on SE Division; the Oaks Bottom House on SE Bybee: and the Fifth Quadrant and nearby Sidebar on North Williams. The main production brewery next to the Sidebar has been expanded several times, but they still have a hard time keeping up with demand. If you're going to have a problem in this economy, I guess that's a good one. The ambiance at the Sidebar is terrific, super comfortable. Lompoc's barrel aging program is instantly evident, as barrels line several walls. These aren't just for show, kids. These are the real deal, each one containing some concoction that will eventually be released. Barrel-aged beers are gaining popularity because they tend to be richer and smoother than beers aged in steel tanks. It's wise to be doing this. Getting to the beers, the starter was Steaming California. I arrived a little early and had a chance to enjoy one of these with John Foyston, the longtime beer guru at The Oregonian. I can't speak for John, but Steaming California is a nicely balanced beer. It has a light body and is just slightly bitter. They use lager yeast to make this stuff, but they ferment it at ale temperatures. That's where "steaming" comes from. We tasted a couple of complex beers next. Flamingo is a pale ale fermented in Cabernet Franc barrels with 35 pounds of sour cherries. This beer is a couple of years old. It's fairly light and slightly tart. Good stuff. Mon Cheri is a Belgian-style golden brewed in 2008. It's mildly fruity and spicy, but smooth as glass. Yummy. 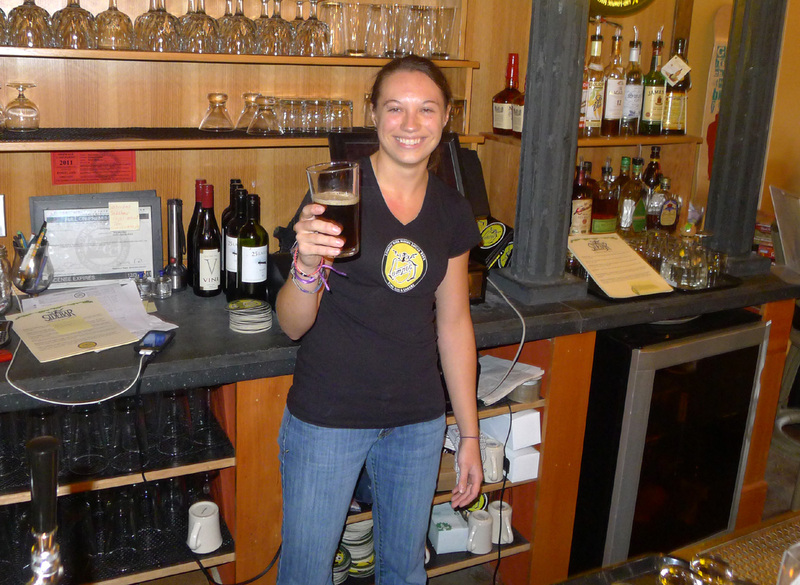 Next was Bierz Brown, the first creation of Lompoc's newest brewer, Irena Bierzynski (yeah, that's her real name). The beer is a dark brown ale called Bierz Brown. Go figure. This beer has a strong chocolate flavor and a malty body. Great fall beer. What's next, Irena? The star of the show was Monster Mash, an imperial porter with exceptionally strong chocolate and roast flavors. They say it has a hint of red fruit flavor, and maybe it does. I carted two bottles of this stuff home and had a glass tonight. The bottled version was apparently aged in barrels, likely for a short period, which definitely adds to the character. I'm not a huge fan of this style, but this beer is excellent. My advice: get some! They'll have it on tap at the pubs for a while and it will be distributed in bombers. We finished out the tasting flight with C-Note Imperial Pale Ale, which is Lompoc's flagship beer. This stuff is brewed with seven "C" hops (Crystal, Cluster, Cascade, Chinook, Centennial, Columbus and Challenger) and anyone who knows of such things knows that those are some of the best hops on the planet. This beer has 100 IBUs and packs a nice punch. But flavor and aroma are what makes the wheel go around with this fine beer. Special thanks to Jerry for hosting this event and also to Chris Crabb, who organized things and made life easy for the beer geek media types. The official Monster Mash Release Party is this Friday at the Sidebar. Good times, for sure.